The Galaxy S8 is only now reaching users’ hands, but we know enough about the device to see how it will fare against iPhone 7 as a business smartphone. Business users have vastly different requirements than the average consumer when it comes to what a smartphone should have and be able to do. While iPhone 7 and iPhone 7 Plus are robust enough to be very useful to a businessperson or corporate executive, there are several other things it lacks. Let’s see if Samsung’s Galaxy S8 and Galaxy S8 Plus can fill in those gaps. iOS does not have a significant VR ecosystem but Android does, relatively speaking. Samsung Galaxy S8 running on Android Nougat fills in the first vital gap that iPhone 7 leaves open: the ability to run VR applications and view them with Gear VR headsets and controllers. VR has tremendous application possibilities in the business world, such as in engineering design, the field of surgery and so on. Even corporate presentations are more engaging when you include the VR element. This has always been a drawback with iPhones, not just the iPhone 7. With no option to add more memory, the 256GB high-end variant of iPhone 7 and iPhone 7 Plus are basically what you’re limited to, unless you move your data to the cloud to make more room for new files. 256GB is enough for most people, even business users, but the fact that you can use a microSD card to extend the Samsung Galaxy S8’s 64GB does offer an advantage when you want to carry HD video presentations, a while bunch of training videos and other such media. You can use multiple microSD cards if you really need to power up on memory, which you can’t do with an iPhone. Samsung DeX will essentially allow you to carry everything you need on your phone, and then simply extend that to an external monitor when you need to. It’s a big game-changer for business users, who will otherwise have to carry their laptops whenever they’re on a business trip. With a Samsung Galaxy S8, that need is greatly reduced except for special situations. There’s no such option with iPhone 7. You can do a handover to a MacBook, but you’ll need to carry the MacBook anyway. Nothing could be easier than charging your Galaxy S8 on a wireless charging pad. And with fast charging, it only takes a few minutes to top up your device before you leave home – or the office. iPhone 7 users, on the other hand, tend to rely on hefty battery packs to extend battery life, and they’re always fiddling around with cables. When you’re spending several hours a day on your smartphone, having a bigger and clearer display is obviously a big factor. The Samsung Galaxy S8 Plus wins hands down over iPhone 7 Plus with its 6.2-inch display. What’s more, Samsung’s AMOLED is superior to the LCD technology that Apple uses, even if it does a great job of rendering the content on its older display tech. Galaxy S8 comes with much more than just fingerprint identification. It includes iris scanning and facial recognition, in addition to standard methods like fingerprint, pattern, PIN and passcode. Facial recognition isn’t the most reliable method, and we’ve already seen that the Galaxy S8’s facial recognition system can be fooled with a mere photograph of the authorized user. But iris scanning is far more trustworthy, making the S8 and S8 Plus more secure than iPhone 7 or 7 Plus, in terms of gaining access to the device. There’s no contest here. The next generation of Bluetooth has a much greater range, offers much more stable connectivity and can even handle two paired headphones at the same time. The Galaxy S8 and Galaxy S8+ are the first smartphones to come with Bluetooth 5.0 support. As Bluetooth 5.0 adoption and support grows, there will be a full range of devices that can connect to your Galaxy smartphone. Not so with iPhone 7. The ability to use headphones with a 3.5mm audio jack is no longer possible on iPhones, starting with iPhone 7. 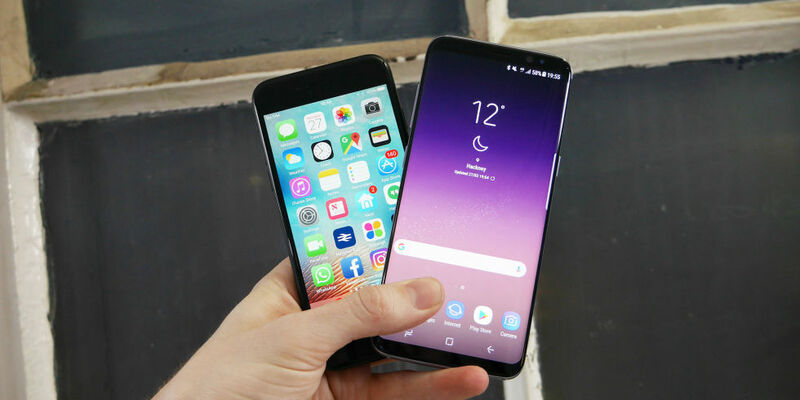 It was a brave move into wireless territory but, practically speaking, a lot of users still prefer a wired experience, which the Galaxy S8 and S8+ continue to offer. Business travelers typically worry about having too many things to charge and too many cables to carry, and a bluetooth headset is just another one on the list that most would rather avoid. The verdict should be obvious by now, but the clear winner in the business smartphone segment has to be Samsung’s duo of Galaxy S8 and Galaxy S8+. iPhone 7 and iPhone 7 Plus are great smartphones, let there be no doubt. However, with different segments having different needs, the latest Galaxy S range will definitely appeal to business users focused on productivity, performance and flexibility. That said, it’s probably not fair to compare a 2017 smartphone with a 2016 model. iPhone 8 could be a far superior phone to the Galaxy S8. But, for now, the South Korean brand is most likely the better of the two as far as business users are concerned.